New updated XV-?? battlesuit / Commander-battlesuit combo kit. New kit is strongly based on the current Commander suit, but not identical. New Kit is designed for much more dynamic assembly & posing options than the current range. Raven guard vs Tau and should be out before Tau release. Tau will be next for 40K, not sure they'll get much new though, possibly just another "Codex and Cards" codex release. Looking like October for that, Age of Sigmar has a lot to get through release-wise. The Tau XV8 Battlesuit Commander kit has been pulled from reorder availability early this week. Retailers tell us this is the usual sign for a new replcement kit coming very soon - usually 2 weeks out. That would place a Tau Empire release in the September 12th or 19th timeframe - right on schedule. This means those kits will get replaced with either re-boxes, or updated models in the very near future. Riptide boxes have been recalled and store managers cannot order them in anymore as they are being repackaged with a new sprue for a missile variant. Internal slip up revelealed October releases to the manager. Fire warriors will be a dual kit. No new sub-races for Tau (Kroot & Vepsid only), no model change for them. 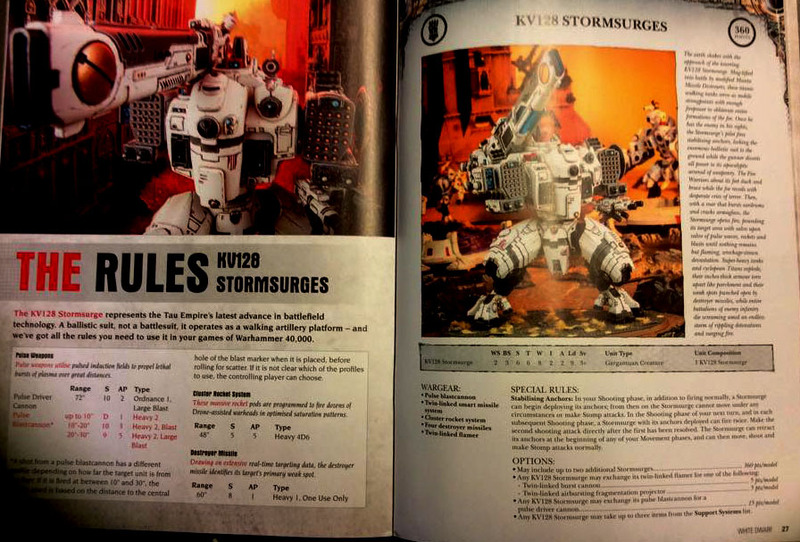 I saw the new Tau codex, unfortunately not the content but the front and back cover, front cover looks like the old codex with a crisis suit. 4. Some Tau specified terrains, sort of a watch tower and a sentry post kind of thing. Be here on Saturday 3rd October to find out more. Last edited by AdamHarry; 09-29-2015 at 09:21 AM. not riptide size but very close. sphere expansion hits the Damocles Gulf!" 1. The torso can be open or closed to show a pilot inside. Both a male and female Tau are included. A good thing to possibly magnetize. 2. The Sensor Arrays are on the battlesuit look the same as the Shadowsun's. 3. The Stealth Drones carry stealth emitters underneath replacing the standard weapons. Countermeasures. Once per game, you can disrupt the targeting of an enemy unit, if it is targeting the Ghostkeel's unit, before dice are rolled. That unit can only make snap shots during that shooting phase. If the Space Marine's limited special character model is yet another Captain with a power fist I think I'll scream. A little variety would be nice. Last edited by Bigred; 10-05-2015 at 09:24 AM. Power Fist and a Plasma Pistol. You can't forget the Plasma Pistol. This seriously seems like a shot in the dark from Steve the Warboss though. C'mon man. I don't have any sources, but I could have made this up off of info we already have regarding previous rumors. I wouldn't mind seeing a set without marines at all. Sounds a little close to heresey! I had thought that we had seen this combo in the past. But then I realised 3rd was DE not tau, tau were just heavily pushed. Tau weren't part of the game when 3rd edition started. They got added after a bit. I wonder if a tau starter set would mean a plastic crisis suit commander. that would be awesome. All I really want is an IG vs Eldar box. Ok, I would buy any box with Eldar, IG, or Sisters in it. ooh, sisters and necrons, do sanctuary 101. that would be amazeballs.